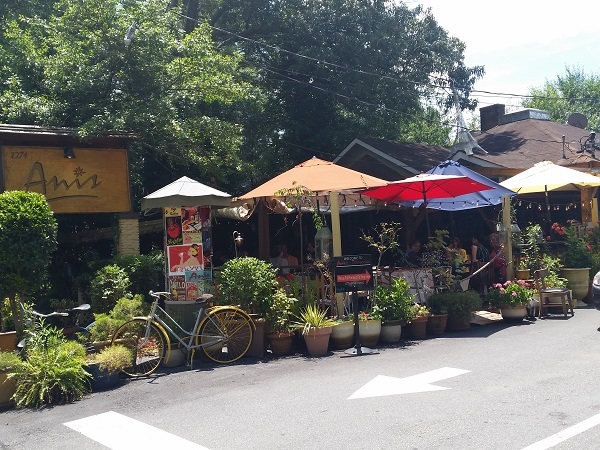 Anis Cafe & Bistro, Atlanta GA – Marie, Let's Eat! A couple of chapters back, I mentioned that Marie’s father was in town and had hoped to have a meal at a French restaurant. As we enjoyed dinner of middle eastern food at Kish in Marietta, I looked up some possibilities for someplace new to us, and Anis Cafe and Bistro in Atlanta’s Buckhead neighborhood popped up. I turned to David and asked whether I remembered correctly, that he’d mentioned this place to us once. He reminded me that he loves Anis and hoped that we’d go. Arnaud Michel, who I understand is from Montepellier, opened Anis Cafe and Bistro in 1994. Michel’s family owns a winery there and he grew up loving food and serving the public. Initially, Anis was a very casual bistro more akin to a coffee shop with a wine list than a full-service restaurant, but business boomed and they expanded within a few years to their current model, offering full menus and an incredibly popular Sunday brunch. 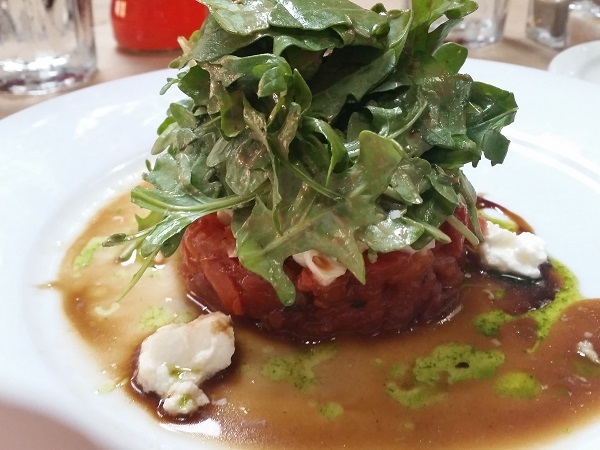 I enjoyed the Tartare de Tomate, which is not likely to be found on the menus of many restaurants in France. Michel created it as a French variant on tomato-mozzarella salads, and it is designed to look like a tomato confit. The tomatoes are seasoned and roasted, and then sprinkled with arugula, cheese, and Saba vinegar. Alas, my goal of a light vegetarian lunch was spoiled because Marie, surprisingly, did not enjoy her sandwich. 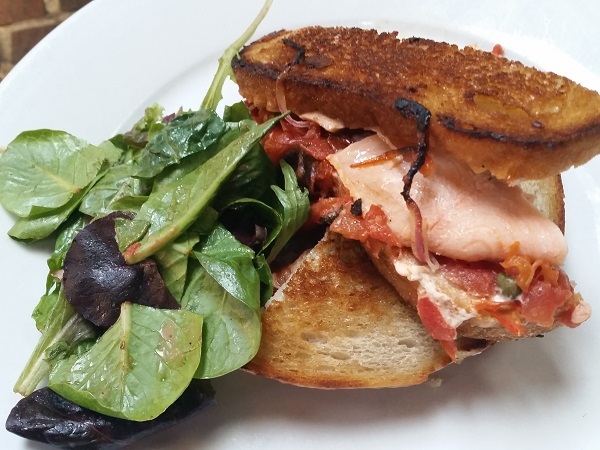 She had the salmon Croque-monsieur, and I thought it was completely wonderful. 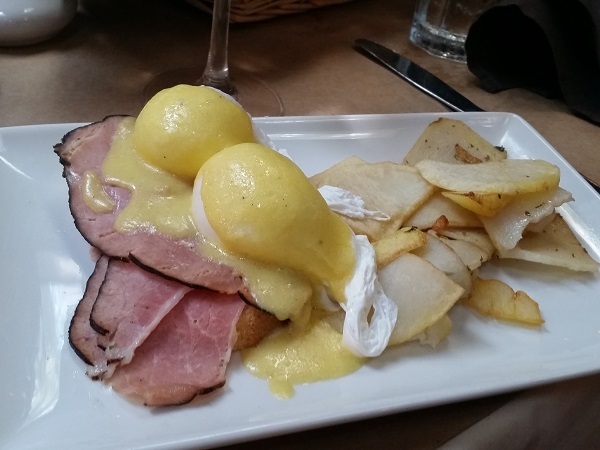 Marie’s brother ordered the steak frites, and her father had the eggs Benedict, which, here, are poached eggs on toasted brioche, with Black Forest ham, hollandaise sauce and a side of Lyonnaise potatoes. They agreed with me that the food was really quite wonderful, although Marie’s father, who’s dined in France a lot more than the rest of us have, and is planning to spend a little time in Provence later this year, observed, neutrally, that Anis provided “French food and American service.” In France, he explained, it’s customary to summon a server, as they otherwise will leave you to dine in peace without checking on you. The dessert was where the trip shined the most, I’m happy to say. Marie’s father had an order of creme brulee in Newfoundland in 1975 that was so good that he has been looking for its equal in North America for forty years. He had one bite, smiled, and told us that he can stop looking now. Regular readers may recall that he lives five and a half hours away from us, but we’re a whole lot closer to him than Newfoundland is. We came toward the tail end of the brunch service and were fortunate to get a table for five, but the patio – and it’s a lovely patio – slowly cleared out over the course of our meal. I only stepped inside the building for a moment, and was charmed by the restroom doors, which are decorated with characters from a Toulouse-Lautrec painting! It’s a shame that Marie didn’t enjoy her sandwich, but the experience was otherwise just fine – I think the creme brulee made up for her disappointment with the salmon – and we’d like to revisit some day and try their dinner menu. Posted on August 14, 2015 August 23, 2017 by Grant G.Posted in atlanta, dessert, georgiaTagged atlanta, brunch, buckhead, dessert, french, georgia.